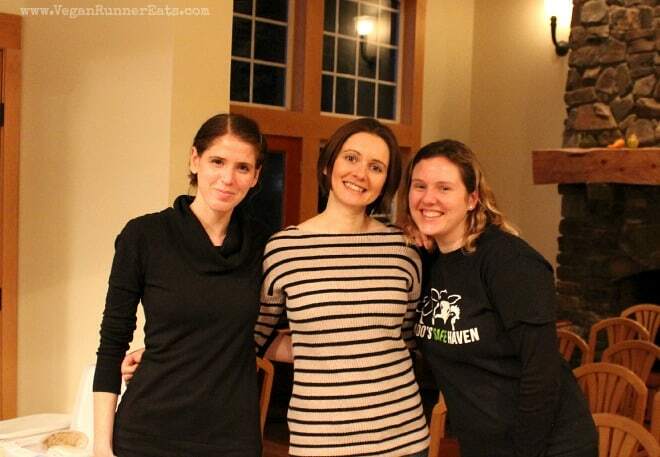 Vegan Runner Eats » Reviews and Giveaways » Rob’s Birthday, Our Trip to Pasado’s Safe Haven Animal Sanctuary, and a Vegan Cooking Class! Do you ever have a feeling like weekends fly by too quickly? I sure felt that way last weekend! Maybe we just had too much fun? It was Rob’s birthday last Saturday, and since we decided a while ago that experiences, not material things, are the best gifts, I was excited to find out that Pasado’s Safe Haven animal sanctuary was having a tour on its premises AND hosting a vegan cooking class by Fire and Earth Kitchen on that day. So I went on to book the tour as a birthday gift for Rob. A few days earlier, Rob requested a cake that would have chocolate sponge layers and the frosting based on the filling of his favorite Chocolate Peanut Butter Oreo Pie from Kathy Hester’s The Great Vegan Bean Book , known in the book as Black-Eyed Pea-Nut Butter Pie. Naturally, I obliged, and used the Adonis Cake recipe from Rip Esselstyn’s My Beef with Meat for the chocolate sponge part. 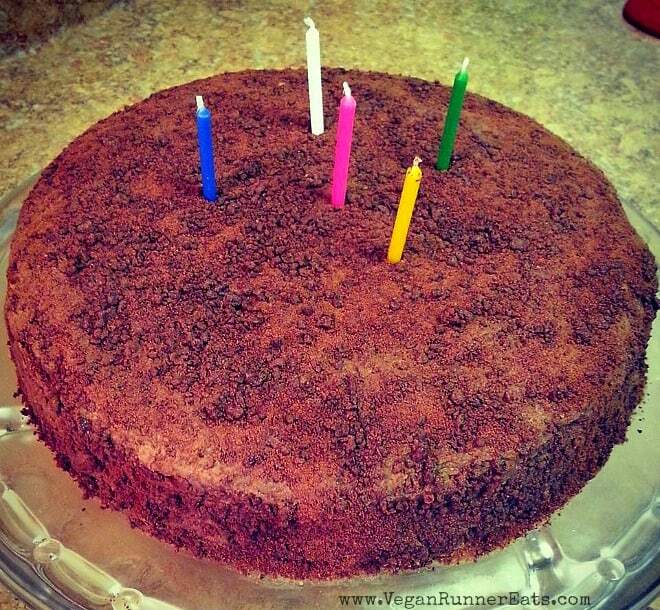 So this was probably the healthiest chocolate birthday cake ever made, with no oil or added fat, except for the fat in peanut butter and chocolate chips. 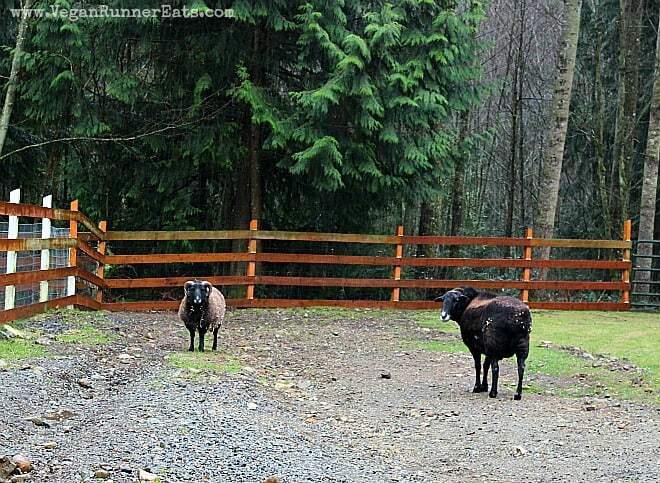 Later in the afternoon, we made our way to Pasado’s Safe Haven located in a beautiful wooded area outside of Seattle. We weren’t particularly lucky with the weather as it started raining just before we got to Pasado’s, but that’s Seattle for ya! 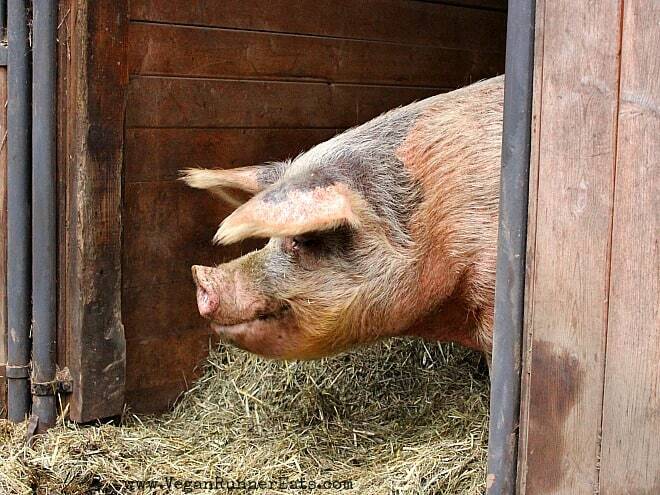 Pasado’s Safe haven was established in 1997 as a special sanctuary for abused and neglected animals. Its name honors a special donkey called Pasado who used to live at a community park outside of Seattle in early 1990s. His sweet personality brought joy into lives of countless people. In 1992, Pasado the donkey was beaten and strangled to death by three teenagers who snuck into his pasture at night. The community was outraged, but the existing laws of the time were only enough to charge Pasado’s torturers with breaking and entering the park after dark. 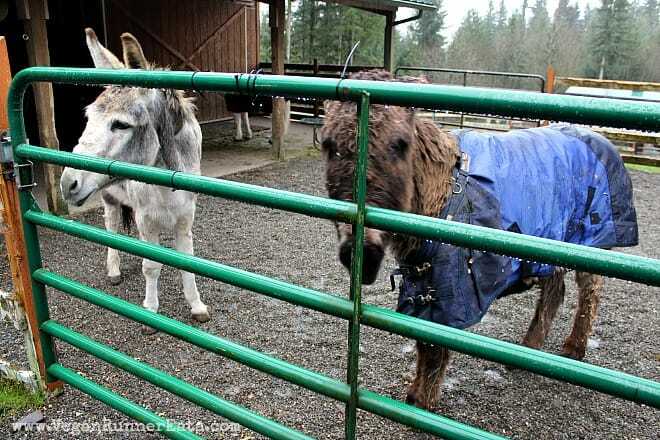 Eventually, Washington State’s laws were changed, and a number of volunteers went on to found what we now know as Pasado’s Safe Haven – a place where all animals can safely live their lives surrounded by love and respect. The tour of Pasado’s started shortly after we arrived. Despite (or because of) the rain, the place seemed very peaceful. Dani and Eve, the team members of Pasado’s, told us how the animals found their way here, and introduced us to every resident. Each animal has a name, and is treated with lots of respect. The turkeys greeted us with their signature clucking call – how cute is that?! Every year for Thanksgiving, Pasado’s Safe Haven hosts a fancy dinner, and these guys are treated like VIPs. They even walk the red carpet! 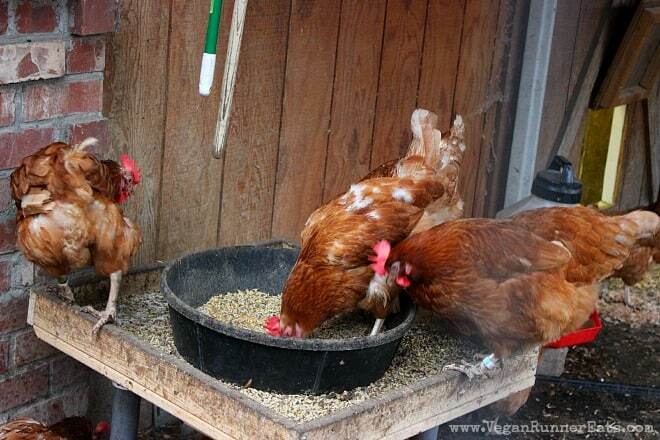 These lovely chickens were brought to Pasado’s from a factory farm. Sadly, they arrived debeaked, i.e. they had undergone a procedure of having a part of their beak cut off – this is done so that the chickens crammed in tight cages at large factory farms didn’t accidentally harm each other. Unfortunately, debeaking also makes it hard for them to eat and drink. 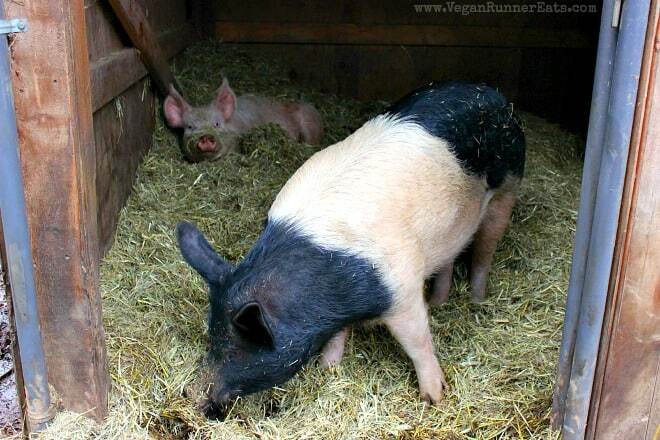 Luckily for these ladies, their torture days are over, and now they can live in safety for the rest of their life. The donkeys were excited to see us too: two of them came up to us and received plenty of petting, as well as treats in form of lettuce leaves. After the tour, it was nice to come back to the warmth of the main building just as Renee and Nick from Fire and Earth Kitchen got everything set up to start the cooking class. If you’ve been following my blog for a while, you may remember my review of their cooking class on Southeast Asian cuisine that Rob and I took back in May, shortly after we moved to Washington State. This time, the theme of the class was Cold Weather Comfort Foods – just what we needed on a cold and rainy day in the Pacific Northwest! Just like during our previous cooking class, we were glad to experience Renee’s easy-going, no-fuss approach to making delicious vegan food. She made everyone feel at ease, giving us lots of useful tips and answering questions. The menu of the day included shiitake ‘bacon’ spinach salad, creamy mac’n’cheese with a side of stewed tomatoes, and strawberries and cream cheesecake. Everybody received recipe cards at the beginning of the class, so we were able to follow along. 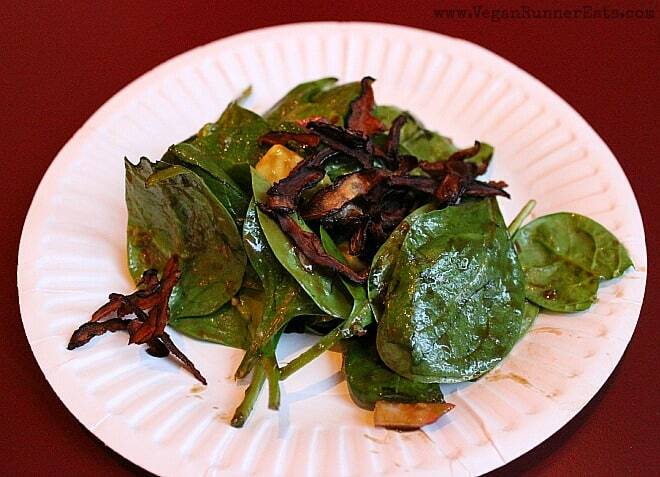 First came the shiitake ‘bacon’ spinach salad with a warm shallot dressing. We were very impressed with Renee’s recipe for the shiitake ‘bacon’ that didn’t include liquid smoke – a common ingredient in most of the vegan ‘bacon’ recipes I’ve ever seen. The warm dressing slightly wilted the spinach, and the crispy baked shiitake ‘bacon’ gave the salad a nice crunch. 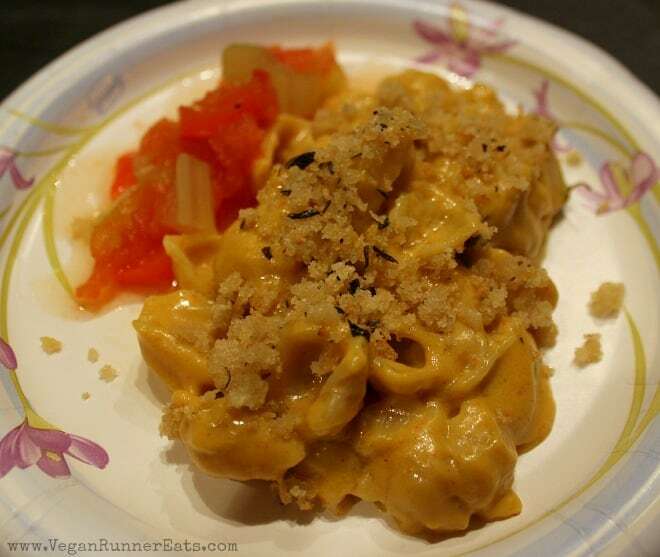 The main course of the night was creamy mac’n’cheese that Renee made with gluten-free pasta. It was so good that I made it again the following day! Renee topped mac’n’cheese with a delicious herbed breadcrumb topping, and served it with stewed tomatoes that surprisingly complemented the flavor of the pasta. But the culmination of the night was the delicious raw strawberries and cream cheesecake! Renee used an almond and pecan-based crust, and topped it with creamy almond and strawberry custard that she made in a Vitamix. I was particularly excited about this recipe because Rob just got me a Vitamix for Christmas (you should have seen the happy dance I did all over our living room when I unwrapped it!). 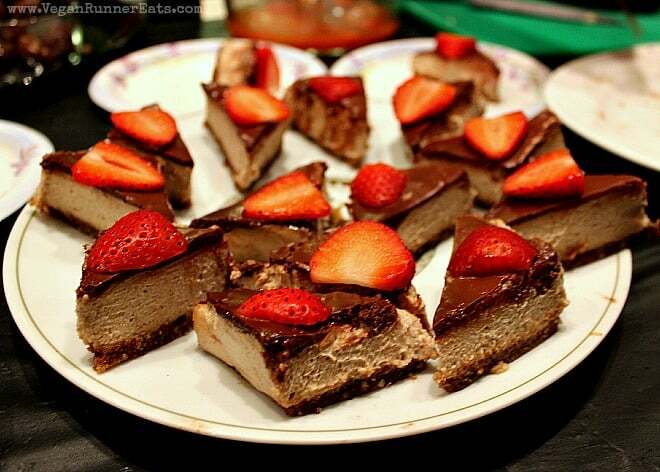 I’m definitely seeing this cheesecake being made in my kitchen in the near future! Pasado’s Safe Haven in Monroe, WA – it’s open to the public on certain days, the closest upcoming day being February 14th. Bring your whole family to give (and receive) love and compassion! Check out their site for more info. Fire and Earth Kitchen – Renee single-handedly (okay, with some help from her partner Nick) runs this cooking business, bringing her love for delicious vegan and gluten-free food to the masses in various ways, from monthly cooking classes to personal chef services and food coaching. See her site for the upcoming classes and lots of other info. 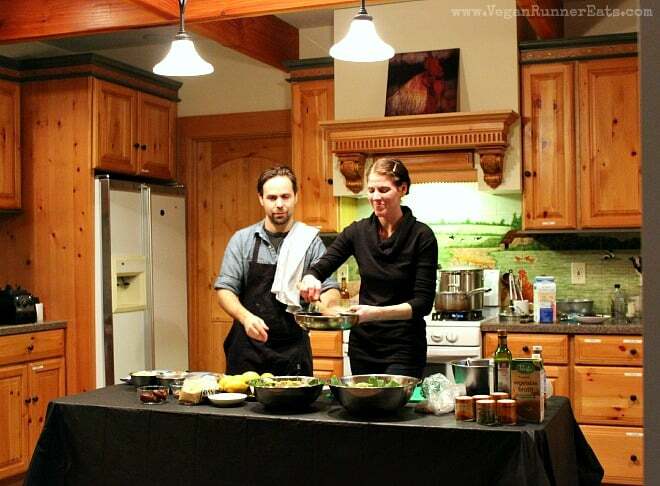 Question for you: have you ever taken a cooking class, vegan or non-vegan? If you’d like to take one, what cuisine/theme would you like to explore during that class? First time here? Let’s stay in touch! You can follow Vegan Runner Eats by subscribing in the top right corner of this post, or by following the blog on Facebook, Twitter, Google+ and Instagram! Tagged Fire and earth Kitchen, Pasado's Safe Haven. Bookmark the permalink. 2 Responses to Rob’s Birthday, Our Trip to Pasado’s Safe Haven Animal Sanctuary, and a Vegan Cooking Class! Alina, first you are so cute! Thank you for sharing your Saturday and a very belated Happy Birthday to Rob. Is it possible to share the recipes? Have a wonderful (hopefully sunny) week-end! Aww Liz, thank you! I’ll tell Rob you said happy birthday 🙂 As for Renee’s recipes, I don’t think she has shared those particular recipes anywhere yet, but check out her incredible Creamy Pumpkin Seed Alfredo Pasta with Kale and Peas that’s been a complete game-changer in our house on nights when I don’t have a lot of time to cook.